By Todd Abelson NMLS #180858 on April 22, 2019 . Although there were a number of better than forecast major quarterly earnings reports released, trading was rather quiet with the major stock indexes finished “mixed.” This may have been due to the holiday-shortened trading week with the financial markets being closed in observance of Good Friday and the beginning of Passover. Economic news outside of housing was strong, stimulating a moderate rise in longer-term bond yields with the 10-year Treasury note yield reaching a one-month high on Wednesday. March retail sales rebounded more than expected from a small decline in February indicating consumer strength. Also, weekly initial jobless claims plunged to a new five-decade low for the second consecutive week. 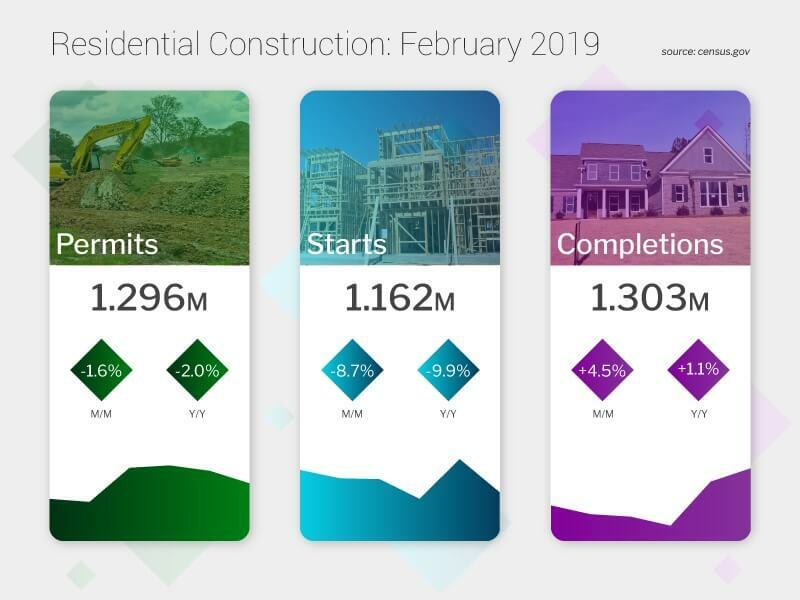 In housing, the Commerce Department reported last Tuesday that Housing Starts declined 0.3% month-over-month in March to a seasonally adjusted annual rate of 1.139 million units. This was below the consensus forecast of 1.247 million and lower than a downwardly revised 1.142 million units in February. Meanwhile, Building Permits were also lower, declining 1.7% month-over-month to 1.269 million. This was also below the consensus forecast of 1.300 million and lower than a downwardly revised 1.291 million in February. Single-family housing starts fell 0.4% month-over-month to 785,000 and were 11.0% lower year-over-year. Single-family permits declined 1.1% month-over-month to 808,000 and were 5.1% lower year-over-year. Regionally, single-family starts in March were up 18.8% in the Northeast; 21.2% lower in the Midwest; 2.8% lower in the South; and 13.9% higher in the West. Single-family permits were down 14.5% in the Northeast; 3.8% lower in the Midwest; 0.9% higher in the South; and unchanged in the West. Elsewhere, mortgage data from the Mortgage Bankers Association (MBA) showed the number of mortgage applications declined from the prior week. The MBA reported their overall seasonally adjusted Market Composite Index (application volume) fell 3.5% for the week ended April 12, 2019. The seasonally adjusted Purchase Index increased 1% from a week prior while the Refinance Index decreased 8%. Overall, the refinance portion of mortgage activity decreased to 41.5% from 44.1% of total applications from the prior week. The adjustable-rate mortgage share of activity decreased to 6.6% of total applications from 7.6%. According to the MBA, the average contract interest rate for 30-year fixed-rate mortgages with a conforming loan balance increased to 4.44% from 4.40% with points decreasing to 0.42 from 0.47 for 80 percent loan-to-value ratio (LTV) loans. For the week, the FNMA 4.0% coupon bond gained 6.30 basis points to close at $102.469 while the 10-year Treasury yield decreased 0.20 of one basis point to end at 2.560%. The Dow Jones Industrial Average added 147.24 points to close at 26,559.54. The NASDAQ Composite Index gained 13.90 points to close at 7,998.06. The S&P 500 Index retreated 2.38 points to close at 2,905.03. Year to date (2019) on a total return basis, the Dow Jones Industrial Average has added 13.86%, the NASDAQ Composite Index has gained 20.54%, and the S&P 500 Index has advanced 15.88%. This past week, the national average 30-year mortgage rate climbed to 4.34% from 4.25%; the 15-year mortgage rate increased to 4.04% from 3.95%; the 5/1 ARM mortgage rate rose to 4.10% from 4.06%; and the FHA 30-year rate was unchanged at 4.00%. Jumbo 30-year rates increased to 4.25% from 4.17%. 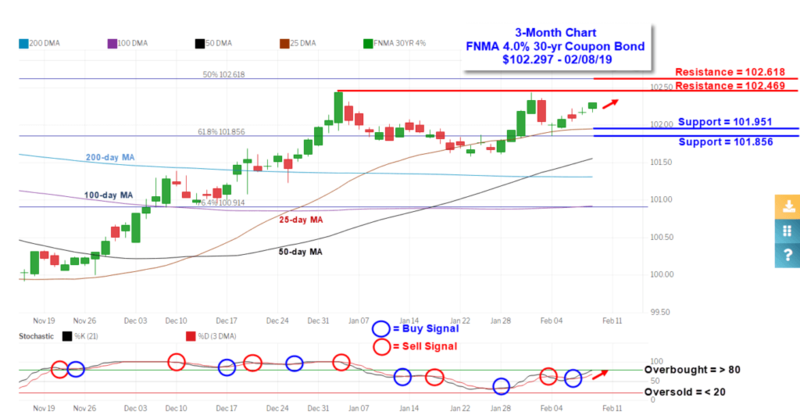 The FNMA 30-year 4.0% coupon bond ($102.469, +6.30) traded within a narrower 17.2 basis point range between a weekly intraday low of $102.328 on Wednesday and a weekly intraday high of 102.500 on Thursday before closing the week at $102.469 on Thursday prior to the Good Friday holiday. Mortgage bonds traded down to the 50-day moving average support level on Tuesday and Wednesday before bouncing a little higher on Thursday. Mortgage bonds are “oversold” so we could see a continuation bounce higher toward a dual layer of resistance beginning with the 25-day moving average ($102.6019) and ending at the 50% Fibonacci retracement level ($102.618). We should see little movement in rates this coming week as long as mortgage bonds remain range-bound between nearest support and resistance levels as seen in the chart below. Overall, there is a slight technical bias toward improved bond prices and slightly lower rates. By Todd Abelson NMLS #180858 on April 15, 2019 . The major stock market indexes traded “mixed” for the week and without much conviction. Daily stock trading volumes posted new year-to-date lows on Monday, Wednesday, and Thursday. Investors appeared to take a wait and see approach as first quarter earnings for 2019 got underway with better-than-expected quarterly earnings reports from banking giants JP Morgan and Wells Fargo on Friday. However, the earnings growth rate for S&P 500 corporations is projected by analysts to decline to around 5% for the first quarter 2019, a far cry from the 20% earnings growth from the same time last year. In economic news, a couple of inflation reports showed inflation remains well contained. Although the Consumer Price Index increased by a more than expected 0.4% in March, the core rate of inflation (excluding food and energy) only increased by 0.1% for the month and 2.0% on a year-over-year basis, its slowest rate in 13 months. This will likely keep the Federal Reserve “on hold” as far as raising interest rates are concerned. Thursday, the Labor Department reported weekly jobless claims had fallen to their lowest level since 1969 when the labor market was only about 60% of its current size. This historical strength in the labor market is signaling to the bond market that we have a strong economy and as such, longer-term Treasury yields moved modestly higher for the week. 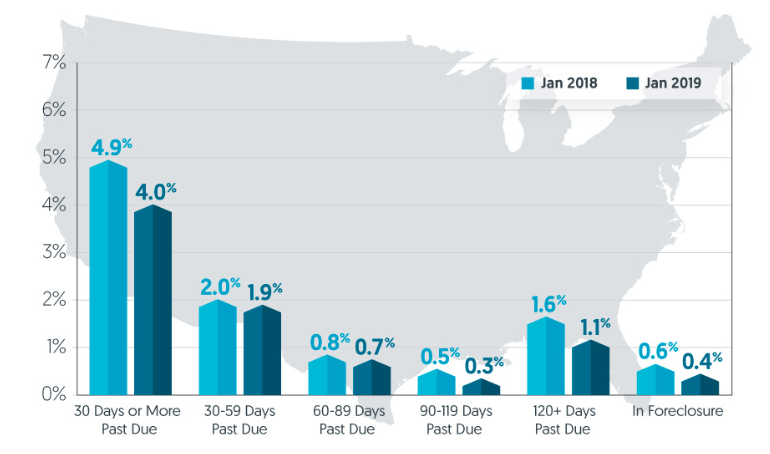 In housing, last Tuesday CoreLogic released their latest Loan Performance Insights Report for January 2019 showing the overall delinquency and foreclosure rates in the U.S. were the lowest in at least 20 years. The overall delinquency rate includes all home loans 30 days or more past due, including those in foreclosure. Overall, the nation’s home mortgage delinquency rate was 4%. This was down from 4.9% a year earlier. The serious delinquency rate, defined as 90 days or more past due, including loans in foreclosure was 1.4% in January 2019, down from 2.1% in January 2018. No state recorded an annual gain in its serious delinquency or foreclosure rate with only North Dakota posting a gain in the overall delinquency rate. The foreclosure inventory rate, the share of mortgages in some stage of the foreclosure process, was 0.4% in January 2019, down from 0.6% a year earlier. Elsewhere, mortgage data from the Mortgage Bankers Association (MBA) showed the number of mortgage applications declined from the prior week. The MBA reported their overall seasonally adjusted Market Composite Index (application volume) fell 5.6% for the week ended April 5, 2019. The seasonally adjusted Purchase Index increased 1% from a week prior while the Refinance Index decreased 11%. Overall, the refinance portion of mortgage activity decreased to 44.1% from 47.4% of total applications from the prior week. The adjustable-rate mortgage share of activity decreased to 7.6% of total applications from 9.5%. According to the MBA, the average contract interest rate for 30-year fixed-rate mortgages with a conforming loan balance increased to 4.40% from 4.36% with points increasing to 0.47 from 0.44 for 80 percent loan-to-value ratio (LTV) loans. For the week, the FNMA 4.0% coupon bond lost 32.8 basis points to close at $102.406 while the 10-year Treasury yield increased 6.31 basis points to end at 2.562%. The Dow Jones Industrial Average retreated 12.69 points to close at 26,412.30. The NASDAQ Composite Index added 45.47 points to close at 7,984.16. The S&P 500 Index advanced 14.67 points to close at 2,907.41. Year to date (2019) on a total return basis, the Dow Jones Industrial Average has added 13.22%, the NASDAQ Composite Index has gained 20.33%, and the S&P 500 Index has advanced 15.98%. This past week, the national average 30-year mortgage rate climbed to 4.25% from 4.21%; the 15-year mortgage rate increased to 3.95% from 3.92%; the 5/1 ARM mortgage rate rose to 4.06% from 4.05%; and the FHA 30-year rate was unchanged at 4.00%. Jumbo 30-year rates increased to 4.17% from 4.13%. 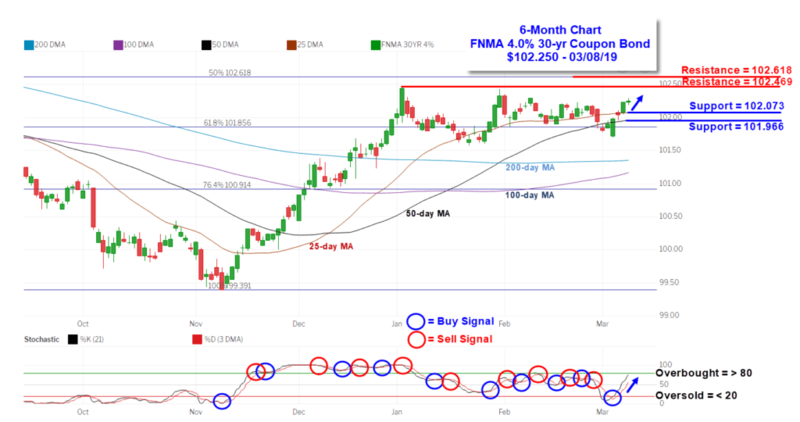 The FNMA 30-year 4.0% coupon bond ($102.406, -32.8) traded within a wider 39.0 basis point range between a weekly intraday high of $102.781 on Monday and a weekly intraday low of 102.391 on Friday before closing the week at $102.406 on Friday. 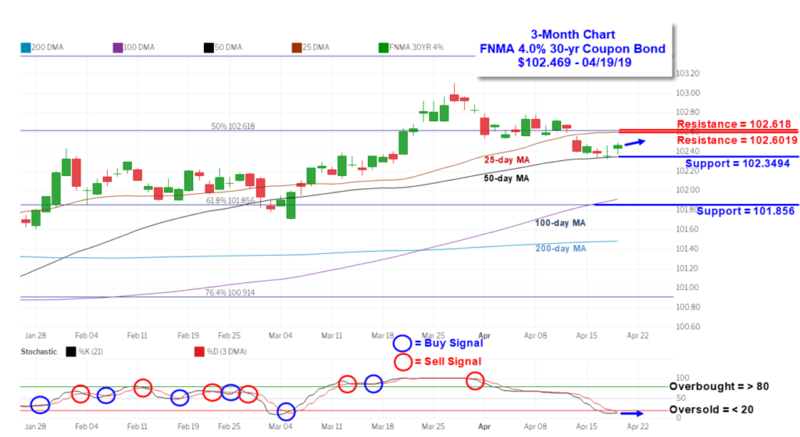 Mortgage bonds traded in a sideways direction along support levels provided by the 50% Fibonacci retracement level ($102.618) and the 25-day moving average ($102.579) until Friday when technical support was broken to the downside. These former support levels now become nearest resistance levels. Technical support is now found at the 50-day moving average ($102.326) and the 61.8% Fibonacci retracement level ($101.856). The slow stochastic indicator shows the bond remains trading on a sell signal while not yet “oversold” suggesting further downside movement could be seen this coming week. If the 50-day moving average fails to hold as support, mortgage bond prices will retreat toward secondary support and 30-year mortgage rates could rise toward 4.50%. By Todd Abelson NMLS #180858 on April 8, 2019 . The stock market recorded moderate gains during the week with the major indexes climbing to within 2% of their all-time highs set during September 2018. The S&P 500 Index also set a new closing high for this year. As a result, bond yields crept higher as investor dollars flowed into riskier asset classes like equities. The move into stocks was fueled by favorable economic news coming from both China and the U.S.
Chinese manufacturing and services indexes moved higher than expected helping to provide a boost in investor sentiment and investing globally. 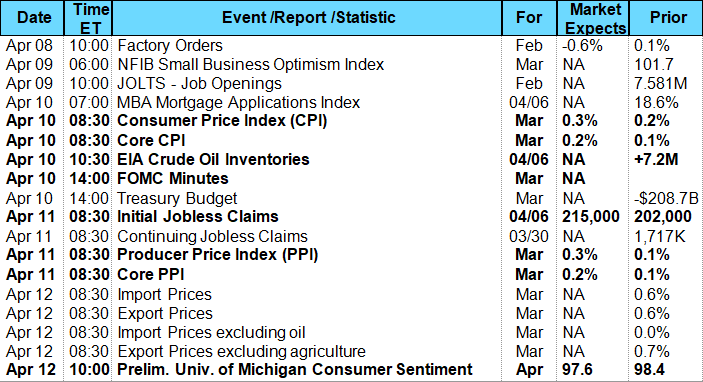 Also helping was news of continuing progress in U.S.-China trade talks and a positive Employment Situation (Jobs) Report for March. After the close of trading last Thursday, President Trump announced an “epic” trade deal could be coming soon. However, key stumbling blocks such as forced technology transfers and enforcement mechanisms remain to be worked out. According to the Xinhua (New China) News Agency, the official state-run press agency of the People’s Republic of China, China’s Vice Premier Liu, stated a “new consensus” has been reached on the text of a trade agreement. President Trump said it will be known probably in the next four weeks or so if a trade deal gets done. 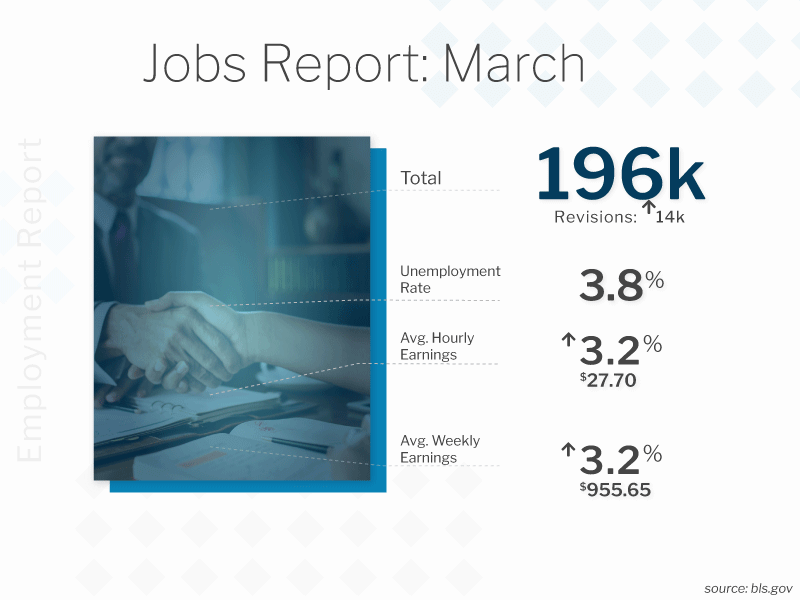 Domestically, the closely monitored monthly Employment Situation (Jobs) Report was released Friday showing the labor market and economy continues to expand but perhaps at a slightly slower pace. The report was given “Goldilocks” status as being one that wasn’t too hot to promote inflation nor too cold to slow the economy. The Labor Department reported employers added 196,000 jobs in March, slightly above the consensus forecast. Plus, February’s dismal jobs number was revised 14,000 higher. The report also disclosed average hourly earnings increased by only 0.1% for the month and by 3.2% over a year earlier, down from a 3.4% rise in February. This should help calm fears concerning wage-based inflation. 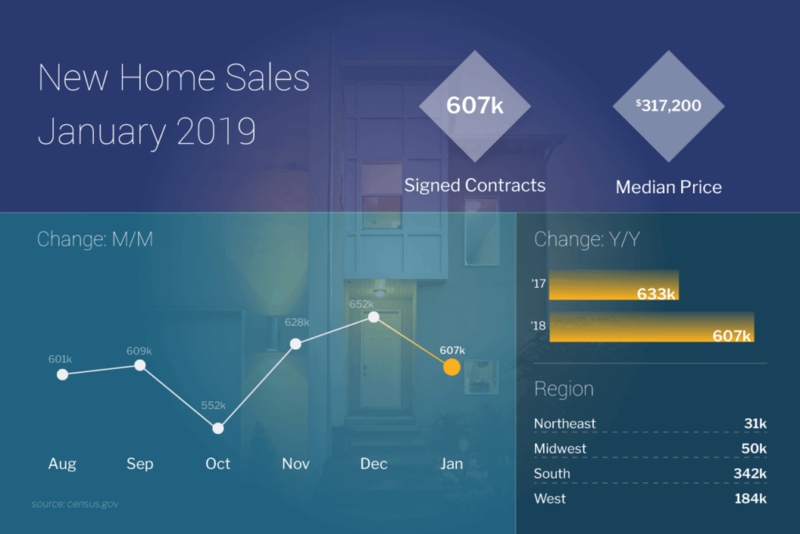 In housing, CoreLogic released its Home Price Index (HPI) and HPI Forecast for February 2019, showing home prices increased both year-over-year and month-over-month. Nationally, home prices increased by 4% year-over-year from February 2018. On a month-over-month basis, prices increased by 0.7% in February 2019. 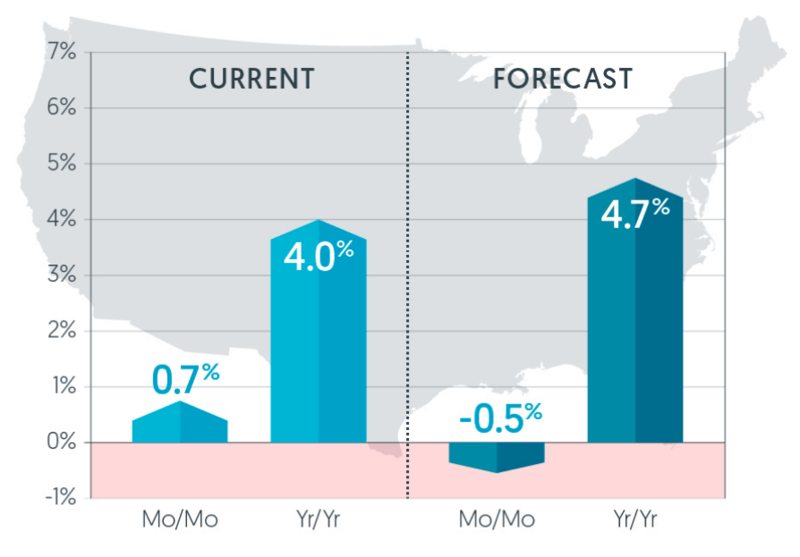 Looking toward the future, the CoreLogic HPI Forecast indicates home prices will continue to rise and increase by 4.7% on a year-over-year basis from February 2019 to February 2020. 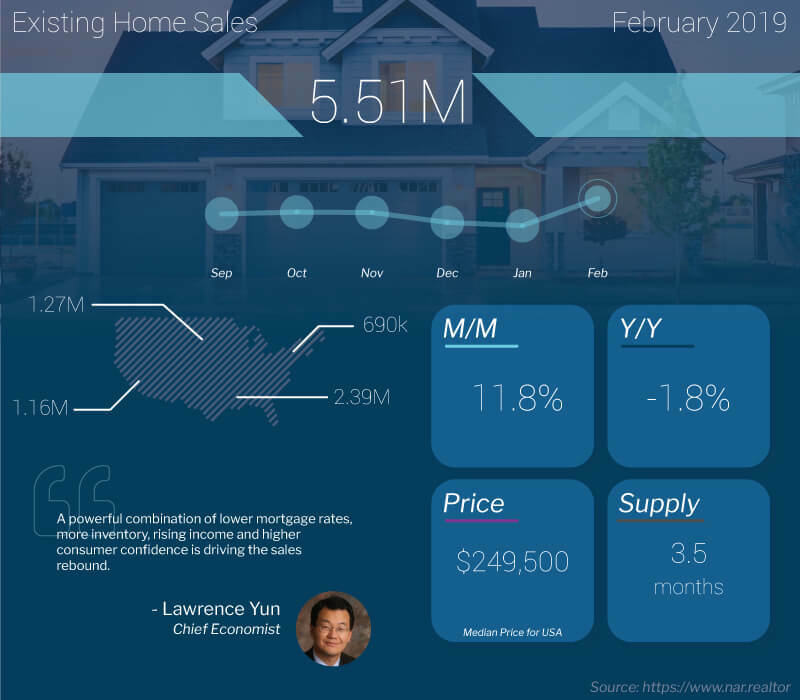 On a month-over-month basis, home prices are expected to decrease by 0.5% from February 2019 to March 2019. Elsewhere, mortgage data from the Mortgage Bankers Association (MBA) showed the number of mortgage applications increased from the prior week. The MBA reported their overall seasonally adjusted Market Composite Index (application volume) increased 18.6% for the week ended March 29, 2019. The seasonally adjusted Purchase Index increased 3% from a week prior while the Refinance Index increased 39% to its highest level since November 2016. Overall, the refinance portion of mortgage activity increased to 47.4% from 40.4% of total applications from the prior week. The adjustable-rate mortgage share of activity increased to 9.5% of total applications from 7.2%. According to the MBA, the average contract interest rate for 30-year fixed-rate mortgages with a conforming loan balance decreased to 4.36% from 4.45% with points increasing to 0.44 from 0.39 for 80 percent loan-to-value ratio (LTV) loans. For the week, the FNMA 4.0% coupon bond declined 9.4 basis points to close at $102.734 while the 10-year Treasury yield increased 8.99 basis points to end at 2.4989%. The Dow Jones Industrial Average gained 496.31 points to close at 26,424.99. The NASDAQ Composite Index added 209.37 points to close at 7,938.69. The S&P 500 Index rose 58.34 points to close at 2,892.74. Year to date (2019) on a total return basis, the Dow Jones Industrial Average has added 13.28%, the NASDAQ Composite Index has gained 19.64%, and the S&P 500 Index has advanced 15.39%. This past week, the national average 30-year mortgage rate climbed to 4.21% from 4.11%; the 15-year mortgage rate increased to 3.92% from 3.82%; the 5/1 ARM mortgage rate rose to 4.05% from 4.00%; and the FHA 30-year rate moved higher to 4.00% from 3.92%. Jumbo 30-year rates increased to 4.13% from 4.00%. 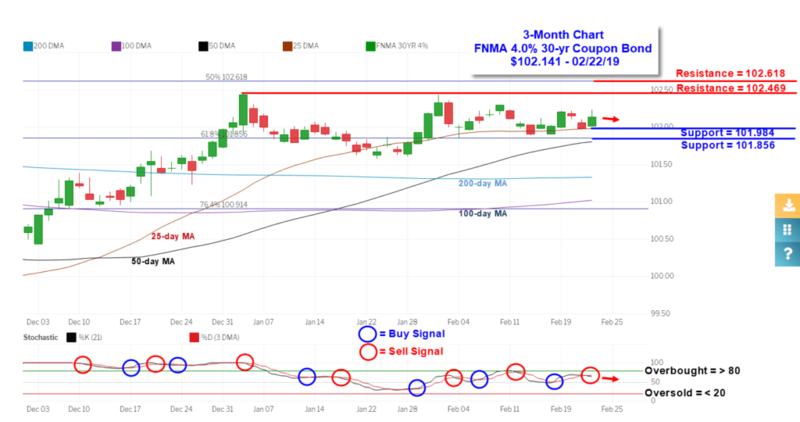 The FNMA 30-year 4.0% coupon bond ($102.734, -9.4) traded within a narrower 26.6 basis point range between a weekly intraday low of $102.531 on Monday and Wednesday and a weekly intraday high of 102.797 on Monday before closing the week at $102.734 on Friday. Mortgage bonds traded in a U-shaped pattern during the week while testing technical support at the 50% Fibonacci retracement support level at $102.618. If this key support level continues to hold, mortgage rates should remain relatively stable for the week. The chart suggests we could see some sideways movement along support further suggesting little movement in rates. By Todd Abelson NMLS #180858 on April 1, 2019 . The stock market performed well despite weaker economic news with the major indexes erasing most of the previous week’s losses while recording the best quarter for stocks in a decade. 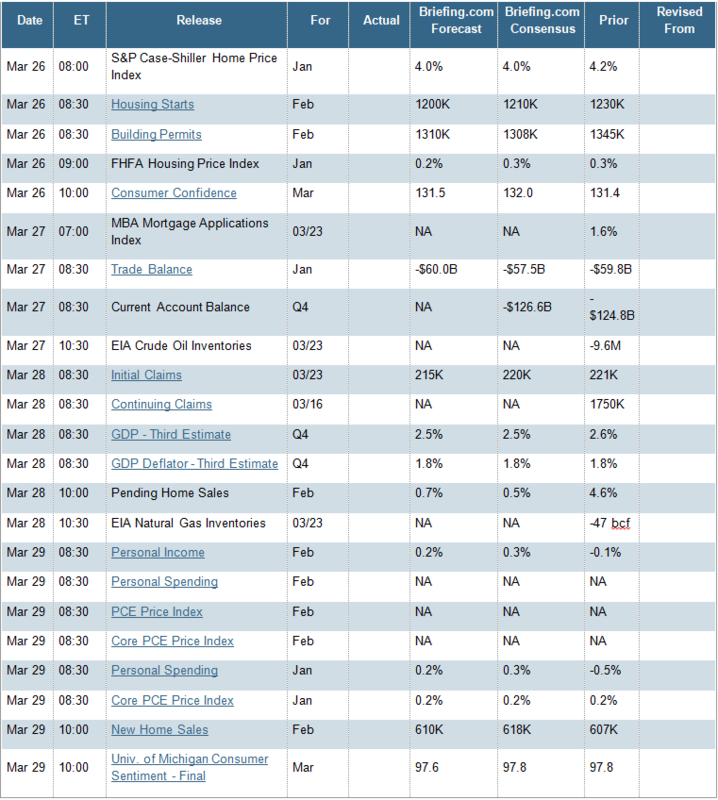 The week’s economic news was generally downbeat, especially in housing data that mostly missed consensus expectations. Personal income and spending data released on Friday also missed forecasts, prompting the Commerce Department to slightly lower its estimate of fourth-quarter gross domestic product (GDP) growth. The weaker economic data allowed bond yields to edge a little lower during the week. The stock market may have been provided some support from news that U.S. – China trade negotiations are progressing toward a deal. Friday, Bloomberg reported Treasury Secretary Steven Mnuchin and U.S. Trade Representative Robert Lighthizer completed two days of trade talks with their Chinese counterparts to go over the wording of the English and Chinese language versions of a trade deal. Despite reports of ongoing disparities between the U.S. and China, both sides are reportedly eager to conclude a deal by the end of April that would head off an escalation of a trade war that is negatively impacting China’s economy. In housing, the Census Bureau reported last Tuesday that Housing Starts decreased 8.7% month-over-month in February to a seasonally adjusted annual rate of 1.162 million units. This was slightly below the consensus forecast of 1.210 million units. However, January Starts were upwardly revised to 1.273 million units from 1.230 million. Building Permits decreased 1.6% month-over-month for February to 1.296 million and were also below a consensus estimate of 1.308 million. January’s Permits were also downwardly revised to 1.317 million from 1.345 million. Single-family starts decreased 17.0% month-over-month to 805,000 while single-family permits that serve as a leading indicator for future home building activity were unchanged month-over-month at 821,000. Housing Starts are now down 9.9% year-over-year while Permits are 2.0% lower year-over-year. Regionally, single-family starts in February were down 42% in the Northeast; down 8.3% in the Midwest; 12.1% lower in the South; and were 24.4% lower in the West. Regionally, single-family permits were 16.4% higher in the Northeast; 7.9% lower in the Midwest; 0.7% higher in the South; and 1.5% lower in the West. 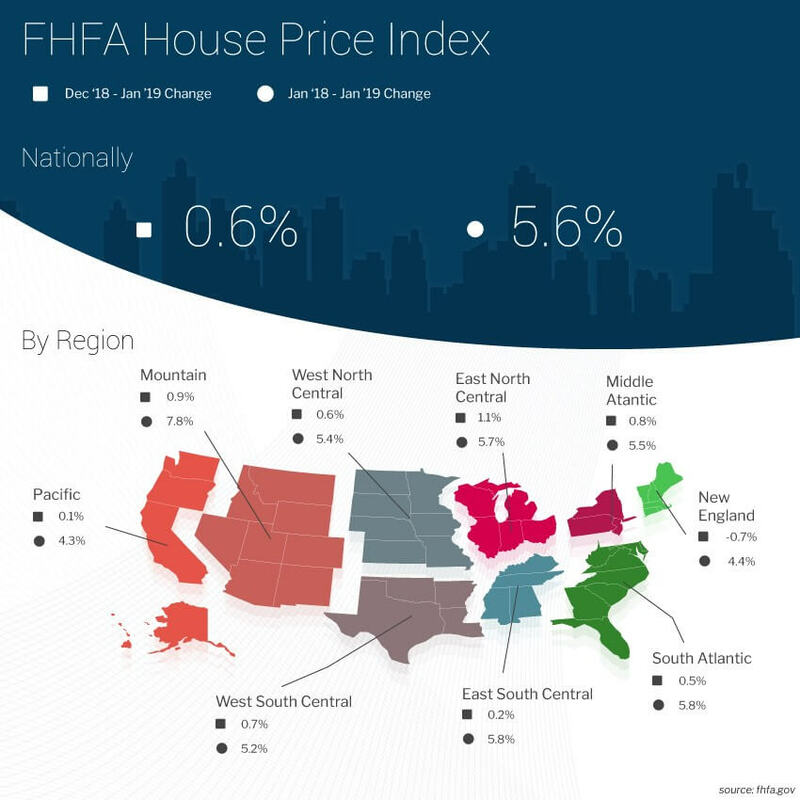 Also Tuesday, the Federal Housing Finance Agency (FHFA) reported U.S. house prices rose in January, up 0.6% from December 2018 according to their seasonally adjusted monthly House Price Index (HPI). The previously reported 0.3% increase for December 2018 remained unchanged. The FHFA monthly HPI is calculated using home sales price information from mortgages sold to, or guaranteed by, Fannie Mae and Freddie Mac. From January 2018 to January 2019, house prices were up 5.6%. For the nine census divisions, seasonally adjusted monthly house price changes from December 2018 to January 2019 ranged from a negative -0.7% in the New England division to +1.1% in the East North Central division. The 12-month changes were all positive, ranging from +4.3% in the Pacific division to +7.8% in the Mountain division. Thursday, the National Association of Realtors (NAR) reported a slight drop in Pending Home Sales for February. 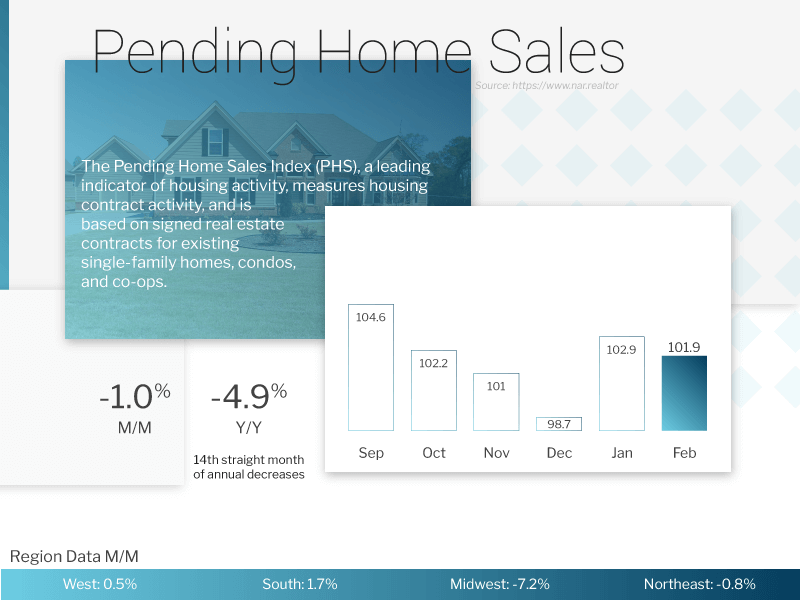 According to NAR’s Pending Home Sales Index (PHSI), a forward-looking indicator based on contract signings, there was a slight 1.0% decrease in the index to 101.9 in February from 102.9 in January. Year-over-year contract signings declined 4.9%, making this the fourteenth straight month of annual decreases. Regionally, the PHSI fell 0.8% in the Northeast to 92.1 in February, and is 2.6% below a year ago. 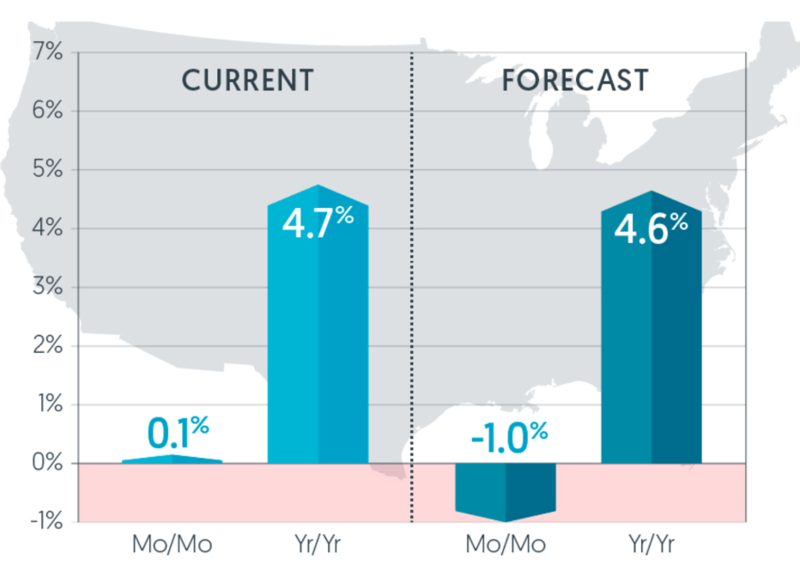 The PHSI fell 7.2% in the Midwest to 93.2, 6.1% lower year-over-year. The PHSI in the South was 1.7% higher to 121.8, which is 2.9% lower year-over-year. The PHSI in the West increased 0.5% to 87.5 and fell 9.6% year-over-year. Friday, the Census Bureau and the Department of Housing and Urban Development jointly reported New Home Sales increased 4.9% month-over-month in February to a seasonally adjusted annual rate of 667,000. This was above the consensus forecast of 618,000 and an upwardly revised 636,000 in January. On a year-over-year basis, new home sales increased by 0.6%. The median sales price fell 3.6% year-over-year to $315,300 while the average sales price increased 1.6% to $379,600. Homes priced at $399,999 and less accounted for 71% of total homes sold in February versus 74% in January. Regionally, new home sales were 4.9% higher in the Northeast; 28.3% higher in the Midwest; 1.8% higher in the South; and were unchanged at 0.0% in the West. The inventory of new homes for sale dropped to a 6.1-months’ supply in February from 6.5-months’ supply in January. It appears a decrease in median sales price is stimulating an increase in new home sales. Elsewhere, mortgage data from the Mortgage Bankers Association (MBA) showed the number of mortgage applications increased from the prior week. The MBA reported their overall seasonally adjusted Market Composite Index (application volume) increased 8.9% for the week ended March 22, 2019. The seasonally adjusted Purchase Index increased 6% from a week prior while the Refinance Index increased 12%. Overall, the refinance portion of mortgage activity increased to 40.4% from 39.2% of total applications from the prior week. The adjustable-rate mortgage share of activity increased to 7.2% of total applications from 7.1%. According to the MBA, the average contract interest rate for 30-year fixed-rate mortgages with a conforming loan balance decreased to 4.45% from 4.55% with points decreasing to 0.39 from 0.42 for 80 percent loan-to-value ratio (LTV) loans. For the week, the FNMA 4.0% coupon bond gained 1.5 basis points to close at $102.828 while the 10-year Treasury yield decreased 4.6 basis points to end at 2.409%. The Dow Jones Industrial Average gained 426.36 points to close at 25,928.68. The NASDAQ Composite Index added 86.65 points to close at 7,729.32. The S&P 500 Index rose 33.69 points to close at 2,834.40. Year to date (2019) on a total return basis, the Dow Jones Industrial Average has added 11.15%, the NASDAQ Composite Index has gained 16.49%, and the S&P 500 Index has advanced 13.07%. This past week, the national average 30-year mortgage rate dropped to 4.11% from 4.15%; the 15-year mortgage rate decreased to 3.82% from 3.85%; the 5/1 ARM mortgage rate decreased to 4.00% from 4.05%; and the FHA 30-year rate decreased to 3.92% from 3.95%. Jumbo 30-year rates decreased to 4.00% from 4.05%. 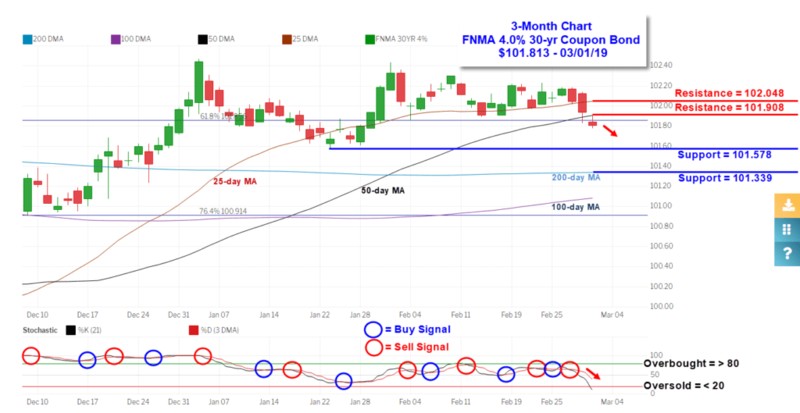 The FNMA 30-year 4.0% coupon bond ($102.828, +1.5) traded within a 40.6 basis point range between a weekly intraday low of $102.703 on Tuesday and a weekly intraday high of 103.109 on Wednesday before closing the week at $102.828 on Friday. Mortgage bonds peaked in price on Wednesday before slipping slightly lower by Friday’s market close. The trading action from Wednesday through Friday resulted in a negative stochastic crossover sell signal from a highly overbought position on Friday signaling bond prices could continue lower toward the 50% Fibonacci retracement support level at $102.618. Should this move play out, mortgage rates could slide slightly lower for the week. 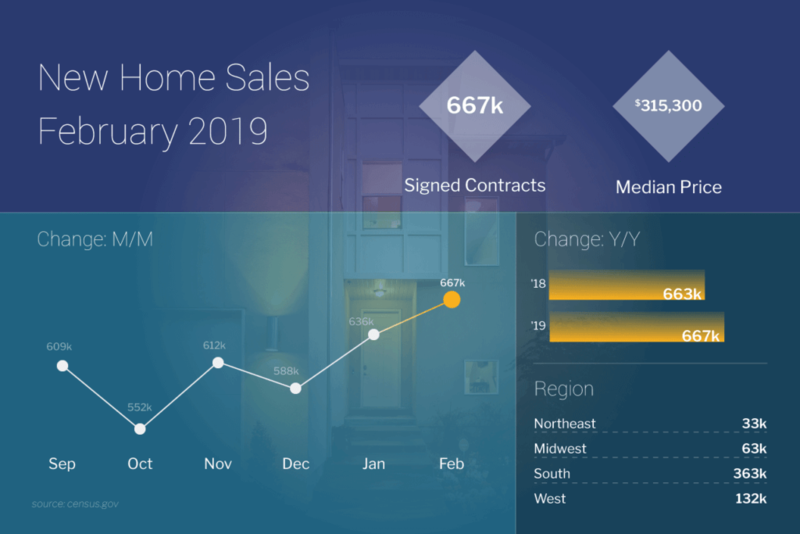 By Todd Abelson NMLS #180858 on March 25, 2019 . The big news of the week was the Fed’s two-day meeting and Fed Chair, Jerome Powell’s, press conference. The Fed announced that there will not be any more rate hikes this year. Additionally, they downgraded their outlook on the economy and expect only 2.1% growth in 2019…a big drop from the 3% we saw in 2018. On the Fed’s Balance Sheet – The big headline was that the Fed is going to stop Treasuries and MBS from running off their balance sheet. Currently there is a Maximum of $50B per month that rolls off each month from their proceeds of maturing Treasuries and principle payments on Mortgages. The Fed is still going allow Mortgage Bonds to run off. They are going to take the proceeds from MBS and reinvest them into Treasuries. But they are going to be reinvested in a range of Treasuries, not just longer term. They said it will mimic their current holdings…and they are holding mostly shorter-term maturities. This means the Fed may reinvest mostly in shorter term maturities. As Treasuries move higher and yields move lower, there is a natural pull with Mortgage Bonds. This happens because as the spread widens, with Mortgage Bonds offering a higher yield, investors may start to contemplate if it’s worth taking a slightly higher risk for a better return. Because of this, Mortgage Bonds will move higher and interest rates may decrease a bit…but it’s not going to be the help we hoped for. There is not going to be direct buying by the Fed back in MBS. 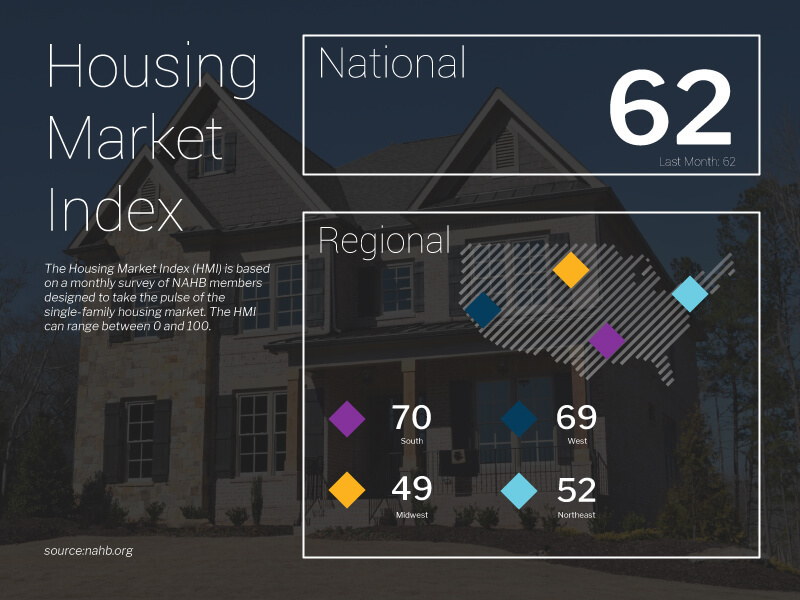 In housing news, The NAHB (National Association of Home Builders) released their Housing Market Index, which is a real-time read on builder confidence for March. 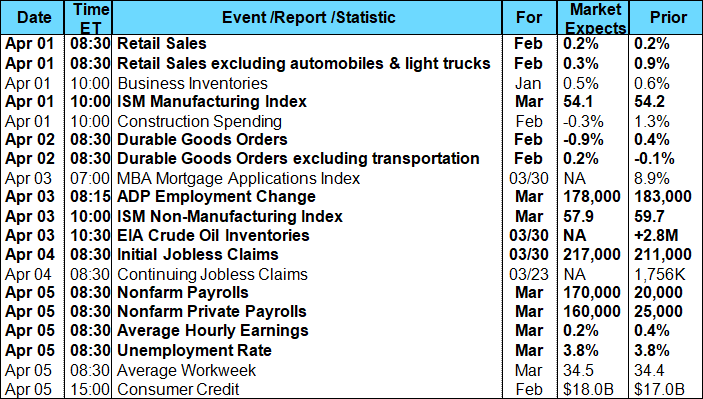 This week’s report came in at 62, which is a strong figure and unchanged from the February reading. Looking at the three components – Current Sales increased 2 points to 68 and Future Sales increased 3 points to 71. Buyer Traffic fell 4 points to 44. Any reading over 50 signals expansion, so buyer traffic is the only one that is slightly weak. “Builders report the market is stabilizing following the slowdown at the end of 2018, and they anticipate a solid spring home buying season,” said NAHB Chairman Greg Ugalde. Existing Home Sales jumped nearly 12% in February, which is much higher than the 3.2% expected. Sales are down 1.8% year over year, but we expect strength in the coming months heading into the spring home buying season. The National Association of Realtors (NAR) attributed the large gain in February to lower rates, more inventory, rising incomes and higher consumer confidence. The Median Home Price was reported at $249,500, up 3.6% year over year. Total inventory at the end of February increased to 1.63 million, up 3.2% from last year. At the current pace of sales, there is a 3.5-month supply, down from 3.9 in January. According to the NAR, a typical homeowner accumulated an estimated $8,700 in housing equity through appreciation over the past 12 months and $21,300 over the past 24 months. And that doesn’t include amortization. Mortgage Bonds moved significantly higher following the Fed’s announcement of the changes coming to the way they handle their balance sheet. Bonds broke above an important technical celling at 102.618, a level that has not been broken since February 2018. Bonds now find themselves in a new range, within 102.618 now acting as support, the next ceiling is all the way up at 102.379, so there is plenty of room for Bonds to improve and move higher. Looking at the stochastics chart, you can see Bonds have been in an overbought territory for the past two weeks. Should Bonds falter, a negative crossover could form, which usually accelerates the move to the downside. A lot will depend on the Stock market and if it can rebound from the losses suffered last week. By Todd Abelson NMLS #180858 on March 18, 2019 . Investors stepped into the stock market to buy the recent dip propelling the major market indexes higher on the week. In fact, the S&P 500 gained 2.9% this week to establish a new high for 2019 with a close on Friday (2,822) at its highest level since last October 10 and above strong resistance located at 2,800. Meanwhile, a combination of U.S. – China trade concerns, mixed domestic economic news, and weaker than expected inflation data drove the yield on the benchmark 10-year Treasury note below 2.60% to 2.591% on Friday, its lowest level since the beginning of January. Weaker than forecast economic data during the week supported the notion the Federal Reserve will stay on the sidelines and not raise short-term interest rates which helped both the stock and bond markets this past week. There were heightened expectations early last week that the U.S. and China would soon reach a trade agreement after comments made by the head of China’s central bank at a news conference, in which he vowed China would not devalue its currency to improve exports or to use it as a weapon in trade disputes. This soon faded though after Bloomberg reported on Thursday that President Trump and China’s President Xi Jinping were unlikely to meet until at least late April if they met at all. 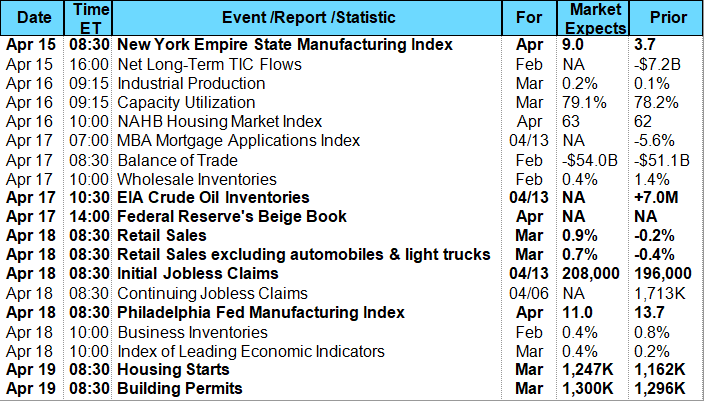 The week’s domestic economic data was mixed with February Industrial Production below estimates, manufacturing output declining for the second consecutive month, and the New York Empire State Manufacturing Index declining more than expected. 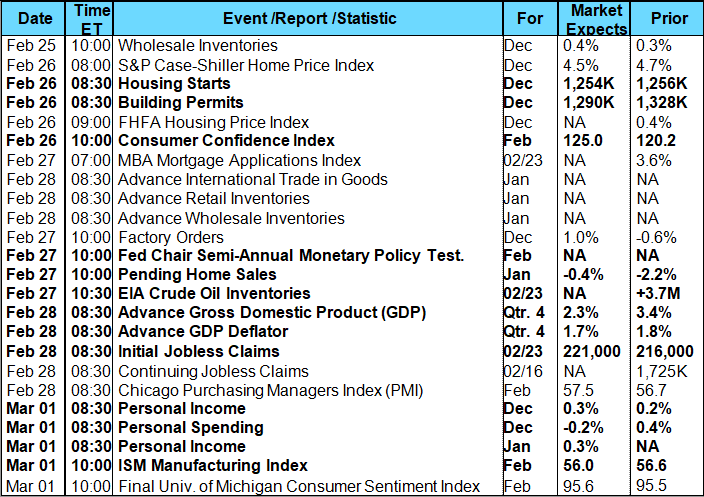 However, Durable Goods Orders jumped in January by the most in six months while Retail Sales and the University of Michigan’s preliminary March Consumer Sentiment Index both rebounded more than expected. In housing, the Census Bureau and the Department of Housing and Urban Development jointly reported New Home Sales fell 6.9% month-over-month in January to a seasonally adjusted annual rate of 607,000. This was below the consensus estimate of 623,000, but December’s initial reading of 621,000 was upwardly revised to 652,000. On a year-over-year basis, New Home Sales were down 4.1%. The median sales price declined 3.8% year-over-year to $317,200 while the average sales price fell 1.2% to $373,100. New Home Sales were down in all regions in January, with the exception of the West. Regionally, sales were down 11.4% in the Northeast; 28.6% lower in the Midwest; down 15.1% in the South; but were 27.8% higher in the West. The inventory of new homes for sale increased to a 6.6 month’s supply at the rate of January sales from 6.3 months in December. Elsewhere, mortgage data from the Mortgage Bankers Association (MBA) showed the number of mortgage applications increased from the prior week. The MBA reported their overall seasonally adjusted Market Composite Index (application volume) increased 2.3% for the week ended March 8, 2019. The seasonally adjusted Purchase Index increased 4% from a week prior while the Refinance Index decreased 0.2%. Overall, the refinance portion of mortgage activity decreased to 38.6% from 40.0% of total applications from the prior week. The adjustable-rate mortgage share of activity declined to 7.2% of total applications from 7.4%. According to the MBA, the average contract interest rate for 30-year fixed-rate mortgages with a conforming loan balance decreased to 4.64% from 4.67% with points increasing to 0.47 from 0.44 for 80 percent loan-to-value ratio (LTV) loans. For the week, the FNMA 4.0% coupon bond gained 10.9 basis points to close at $102.359 while the 10-year Treasury yield decreased 3.9 basis points to end at 2.591%. The Dow Jones Industrial Average gained 398.63 points to close at 25,848.87. The NASDAQ Composite Index added 280.39 points to close at 7,688.53. The S&P 500 Index rose 79.41 points to close at 2,822.48. Year to date (2019) on a total return basis, the Dow Jones Industrial Average has added 10.81%, the NASDAQ Composite Index has gained 15.87%, and the S&P 500 Index has advanced 12.59%. This past week, the national average 30-year mortgage rate dropped to 4.40% from 4.45%; the 15-year mortgage rate decreased to 3.98% from 4.04%; the 5/1 ARM mortgage rate decreased to 4.26% from 4.34%; and the FHA 30-year rate decreased to 4.07% from 4.12%. Jumbo 30-year rates decreased to 4.20% from 4.25%. 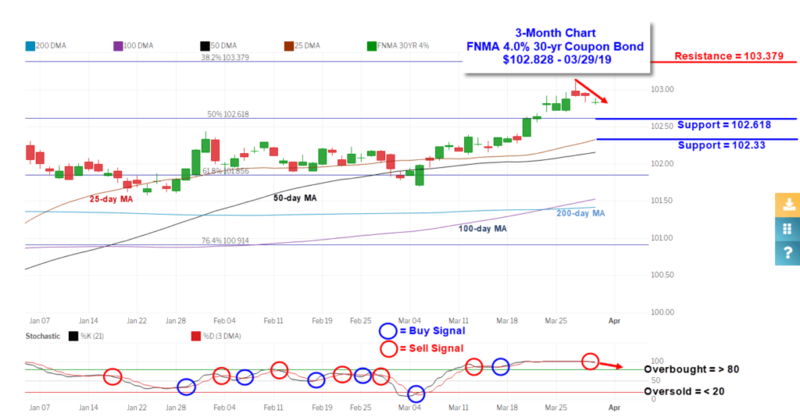 The FNMA 30-year 4.0% coupon bond ($102.359, +10.9) traded within a narrower 26.6 basis point range between a weekly intraday high of $102.391 on Tuesday and a weekly intraday low of 102.125 also on Tuesday before closing the week at $102.359 on Friday. Mortgage bonds reversed direction higher on Tuesday, traded lower on Wednesday and Thursday, then bounced back on Friday to reach just below the weekly high made on Tuesday. This resulted in a weak buy signal on Friday coupled with a sideways direction for the week not far from overhead technical resistance. 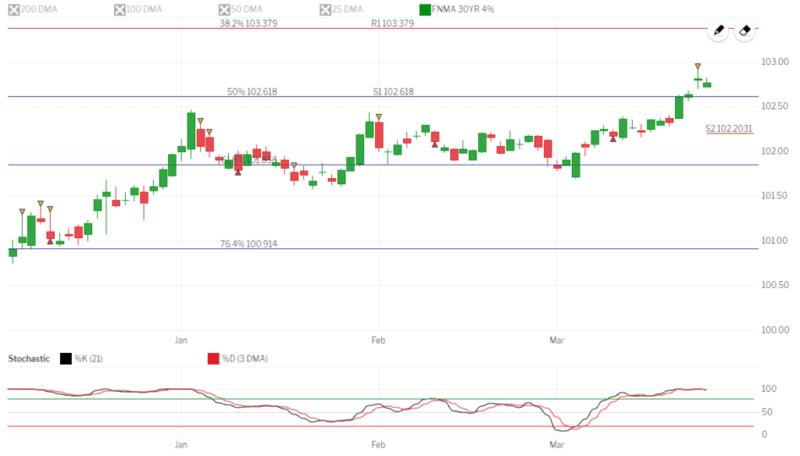 The bond is currently “overbought” and subject to a subsequent move lower, but we could see a continuation of a sideways trading pattern between support and resistance levels with a net effect of fairly stable to very slightly lower mortgage rates for the week. By Todd Abelson NMLS #180858 on March 11, 2019 . The major stock market indexes moved lower during each treading day of the week with the Nasdaq Composite Index conspicuously recording its first weekly drop since late December. As a result, bond yields fell with the 10-year Treasury yield touching its lowest point since January 4th on Friday morning. Investor sentiment was negatively impacted by signs of slowing global growth and little progress on a trade deal between the U.S. and China. Furthermore, the European Central Bank (ECB) also cut its forecast for eurozone growth in 2019 to 1.1% from 1.7% as the U.S. – China trade dispute impacts economies across Europe. ECB President Mario Draghi stated “the economic outlook for the next 22 months has deteriorated after a series of shocks to the global economy, including a cut in China’s growth forecast and Brexit that are likely to persist throughout 2019.” In an effort to stimulate the slowing eurozone economy, the ECB launched a program called the Targeted Longer-Term Refinancing Operation (TLTRO III) consisting of two-year loans to help avoid a squeeze on credit that would lower economic growth. China is also showing signs of an economic slowdown as February exports plunged 20.7% and were far worse than the market’s forecast of a 4.8% decline. Chinese imports of key commodities also fell for the third-straight month and were below estimates. Earlier in the week, China lowered its full-year growth target to 6.0% from 6.5% which would be its slowest growth rate since 1990. 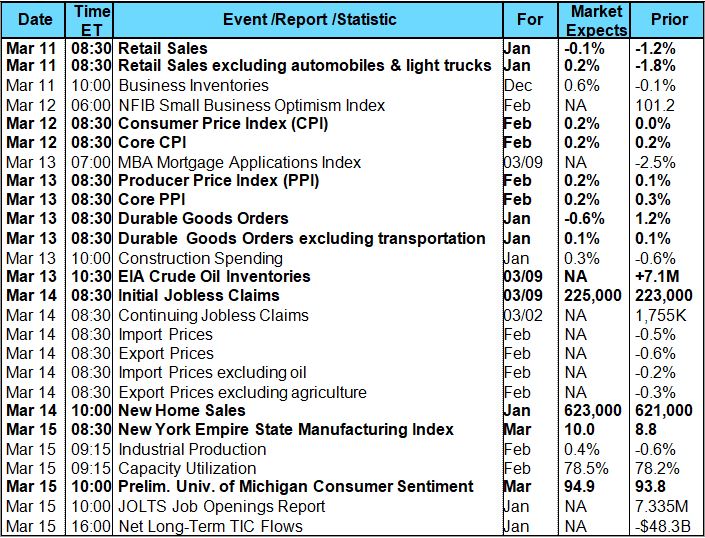 U.S. economic news during the week was mixed. 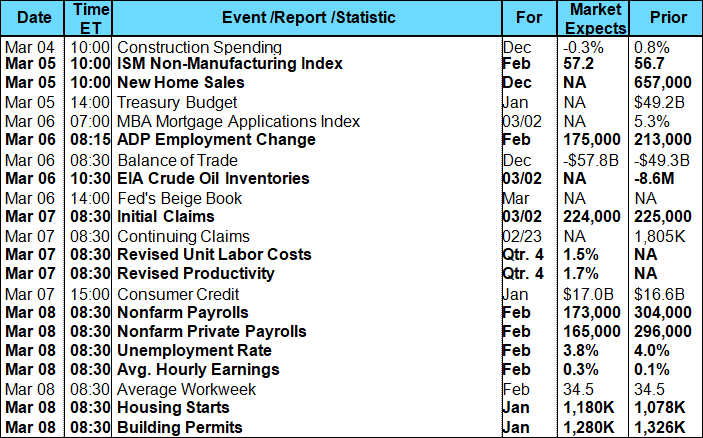 Non- manufacturing activity (Services) in February exceeded consensus forecasts as did New Home Sales for December while the February Employment Situation Report at first glance was very disappointing. The monthly payrolls report from the Department of Labor showed employers added only 20,000 jobs in February, well below expectations of 173,000 and the smallest number since September 2017. As bad as this number was, it may have been weather related and may be revised higher in coming months. Average hourly earnings increased 0.4% with year-over-year average hourly earnings up 3.4%. This is great news as rising hourly earnings forms the basis for increased consumer spending. The February unemployment rate was 3.8%. Persons unemployed for 27 weeks or more accounted for 20.4% of the unemployed versus 19.3% in January. The U6 unemployment rate, which accounts for unemployed and underemployed workers, was 7.3% versus 8.1% in January. The labor force participation rate held steady at 63.2% in February. There are a number of economists expecting payrolls will continue to grow by roughly 160,000 jobs per month, bringing the unemployment rate as low as 3.5% by the end of the year. In housing news, the Commerce Department reported New Home Sales increased 3.7% month-over-month in December to a seasonally adjusted annual rate of 621,000, their highest pace in seven months. This was above the consensus forecast of 572,000. November’s sales were revised down to 599,000 from an annual rate of 657,000. The median sales price fell 7.2% year-over-year to $318,600 while the average sales price dropped 6.4% to $377,000. Regionally, New Home Sales were 44.8% higher in the Northeast; fell 15.3% in the Midwest; were 5.0% higher in the South; and were 1.4% higher in the West. Homes priced at $399,999 and less accounted for 67% of total homes sold in December versus 72% in November. The inventory of new homes for sale dropped slightly to a 6.6-month’s supply at the December sales rate from 6.7 months in November. The improvement in New Home Sales corresponded to a drop in both median and average selling prices. The New Home Sales gains point to a potentially stronger 2019. The purchase of new homes not yet under construction surged 22.4% in December from the prior month. Average 30-year mortgage rates at 4.35%, down from nearly 5% in early November, have also eased some affordability pressures. The Commerce Department also reported Housing Starts increased more than expected in January as construction of single-family housing rebounded after four straight monthly declines. However, Building Permits fell to their lowest level since August 2017 suggesting weakness in single-family homebuilding in the months ahead. Housing Starts increased 18.6% month-over-month in January to a seasonally adjusted annual rate of 1.230 million units exceeding the consensus estimate of 1.180 million. Permits rose 1.4% month-over-month to 1.345 million. Single-family starts increased 4.5% month-over-month to 926,000 while Single-family permits, which have leading indicator status, were down 2.1% month-over-month to 812,000. Regionally, Single-family starts in January were 66% higher in the Northeast; 18.5% higher in the Midwest; 15.5% higher in the South; and 44.9% higher in the West. Single-family permits in January were 1.8% lower in the Northeast; 1.8% higher in the Midwest; 1.3% lower in the South; and 5.8% lower in the West. Elsewhere, mortgage data from the Mortgage Bankers Association (MBA) showed the number of mortgage applications decreased from the prior week. The MBA reported their overall seasonally adjusted Market Composite Index (application volume) decreased 2.5% for the week ended March 1, 2019. The seasonally adjusted Purchase Index decreased 3% from a week prior while the Refinance Index decreased 2%. Overall, the refinance portion of mortgage activity decreased to 40.0% from 40.4% of total applications from the prior week. The adjustable-rate mortgage share of activity rose to 7.4% of total applications from 7.3%. According to the MBA, the average contract interest rate for 30-year fixed-rate mortgages with a conforming loan balance increased to 4.67% from 4.65% with points increasing to 0.44 from 0.42 for 80 percent loan-to-value ratio (LTV) loans. For the week, the FNMA 4.0% coupon bond gained 43.7 basis points to close at $102.250 while the 10-year Treasury yield decreased 12.9 basis points to end at 2.630%. The Dow Jones Industrial Average lost 576.08 points to close at 25,450.24. The NASDAQ Composite Index dropped 187.21 points to close at 7,408.14. The S&P 500 Index fell 60.62 points to close at 2,743.07. Year to date (2019) on a total return basis, the Dow Jones Industrial Average has added 9.10%, the NASDAQ Composite Index has gained 11.65%, and the S&P 500 Index has advanced 9.42%. This past week, the national average 30-year mortgage rate dropped to 4.45% from 4.57%; the 15-year mortgage rate decreased to 4.04% from 4.14%; the 5/1 ARM mortgage rate decreased to 4.34% from 4.44%; and the FHA 30-year rate decreased to 4.12% from 4.22%. Jumbo 30-year rates decreased to 4.25% from 4.37%. 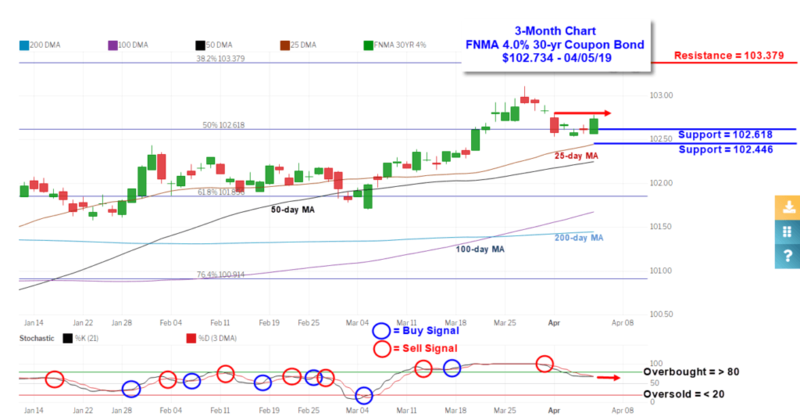 The FNMA 30-year 4.0% coupon bond ($102.250, +43.7) traded within a wider 59.4 basis point range between a weekly intraday high of $102.297 on Friday and a weekly intraday low of 101.703 on Tuesday before closing the week at $102.250 on Friday. Mortgage bonds moved slightly higher last Monday before making a large reversal higher on Tuesday. The bond opened well below Monday’s close of $101.906 and below support at the 61.8% Fibonacci retracement level ($101.856) to open at $101.719 before strongly reversing higher to close at $101.984. This move coincided with stocks pulling back from strong resistance as shown in the S&P 500 chart below. Monday, the S&P 500 Index reached the 2,800 level marking strong technical resistance for the fifth time since last November. Each time the stock market retreated after failing to decisively close above 2,800. 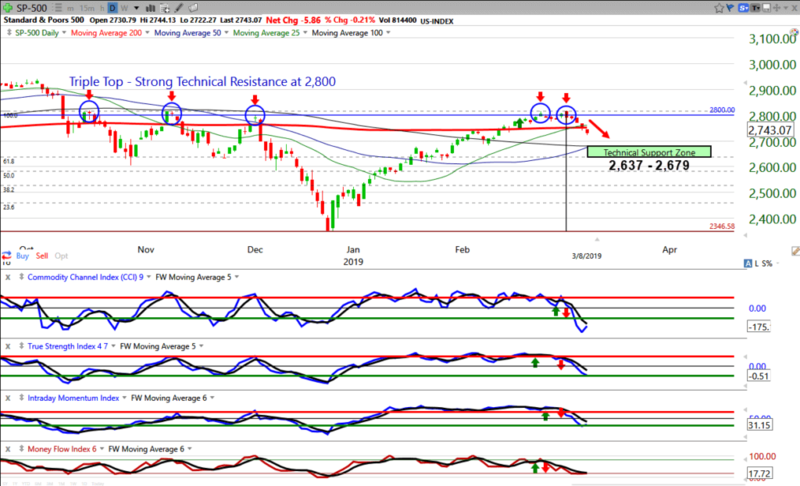 The S&P 500’s inability to sustain a retest of its November high and stay above the 2,800 level triggered technical selling to the drive the Index below its 200-day moving average, a bearish signal. The Nasdaq Composite, Russell 2000, and Dow Jones Transportation Average also fell below their 200-day moving averages, a sign of broad market weakness. There is a support zone for the S&P 500 Index between 2,637 and 2,679 and it appears the Index could move lower to test this zone before making an attempt to rebound. This scenario should bode well for mortgage bond prices and drive them higher for a test of resistance as outlined in the chart below. Stocks are not yet “oversold” and bonds are not “overbought” so we could continue to see higher price movement in bonds with lower yields resulting in slightly lower mortgage rates this coming week. By Todd Abelson NMLS #180858 on March 4, 2019 . The major stock market indexes ended mixed for the week with the S&P 500 and Nasdaq Composite Indexes posting modest gains while the Dow Jones Industrial Average recorded a minor loss. The broader S&P 500 Index at 2,803.69 is now bumping up against what could be a stiff resistance level at 2,800, and it will be interesting to see if the S&P 500 can manage to decisively move above this level or get turned away as it has three times since last October. The week’s economic news was mostly disappointing, especially in the housing sector, but this was largely offset by news of progress in trade negotiations between the U.S. and China. President Trump announced the U.S. would delay the application of higher tariffs on Chinese goods scheduled for March 1 after citing “substantial progress” has been made on a range of issues. These issues include intellectual property protection, technology transfer, currency manipulation, and increases in Chinese purchases of U.S. agricultural products and services. Although the administration’s chief trade negotiator, Robert Lighthizer, told a congressional committee “much still needs to be done” before an agreement could be reached, there was news U.S. officials were drafting a trade agreement President Trump and Chinese President Xi Jinping could sign as early as mid-March and this seemed to lift investor sentiment. There were several housing reports released during the week. 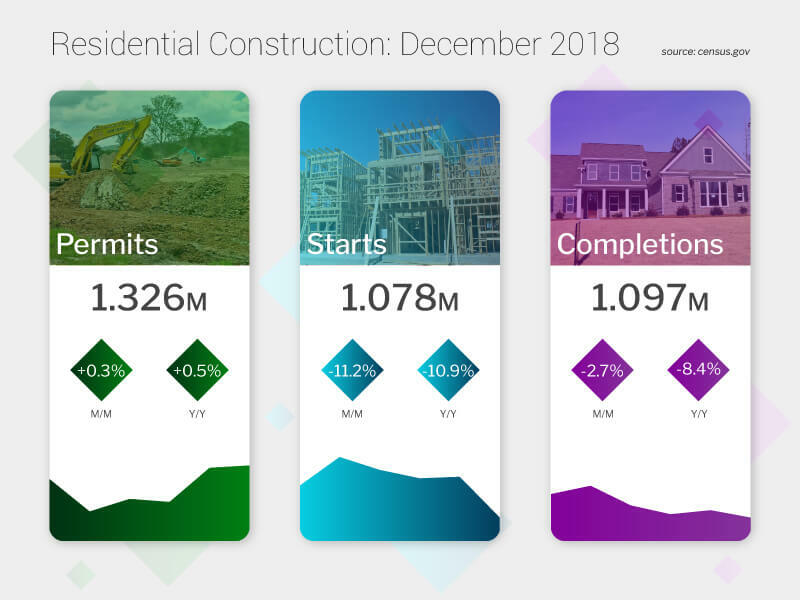 Tuesday, the Commerce Department reported Housing Starts fell 11.2% month-over-month in December to a seasonally adjusted annual rate of 1.078 million. This was below the consensus forecast of 1.254 million and was the lowest level in more than two years. Over the past 12 months, Housing Starts have declined by 10.2%. Single-family production declined 6.7% to 758,000 units while multifamily starts fell 20.4% to a seasonally adjusted annual rate of 302,000 units. Despite the monthly loss, both single-family and multifamily starts posted an annual gain. Single-family production increased 2.8% in 2018 to a rate of 872,800. Multifamily starts posted 5.5% growth in 2018 to 373,700 units. 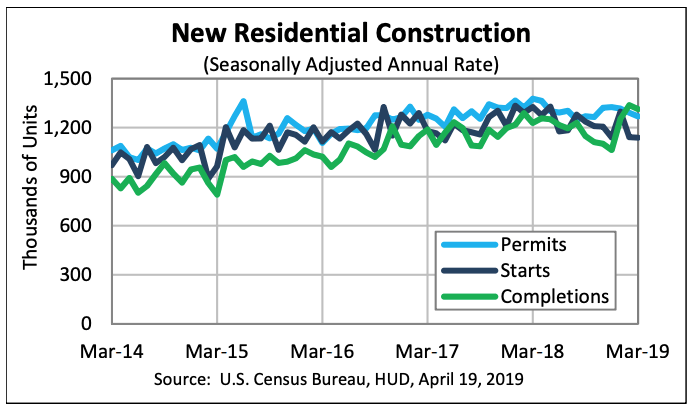 Building Permits on the other hand increased 0.3% month-over-month to a seasonally adjusted annual rate of 1.326 million, exceeding the consensus estimate of 1.290 million. Among single-family houses, permits fell 2.2% in December and 5.5% from a year ago. Further, the Federal Housing Finance Agency (FHFA) released their latest House Price Index (HPI) revealing U.S. house prices rose 1.1% in the fourth quarter of 2018. On a year-over-year basis, house prices rose 5.7% from the fourth quarter of 2017 to the fourth quarter of 2018. FHFA’s seasonally adjusted monthly index for December was up 0.3% from November. Home prices increased in all 50 states and the District of Columbia between the fourth quarters of 2017 and 2018. The areas showing the greatest annual appreciation were: Idaho 11.9%; Nevada 11.2%; Utah 9.8%; Georgia 8.2%; and Arizona 8.2%. The areas showing the smallest annual appreciation were: North Dakota 0.0%; Connecticut 0.9%; 3) West Virginia 1.6%; Louisiana 1.8%; and Oklahoma 2.0%. Of the nine census divisions, the Mountain division showed the strongest four-quarter appreciation at an 8.1% percent gain while the weakest annual house price appreciation was seen in the West South Central division with 4.3% gain. Wednesday, the National Association of Realtors (NAR) reported Pending Home Sales bounced back strongly in January with all four major regions seeing growth. The NAR’s Pending Home Sales Index, a forward-looking indicator based on contract signings, increased 4.6% to 103.2 in January, up from 98.7 in December. However, year-over-year contract signings fell 2.3%, making this the thirteenth straight month of annual decline. 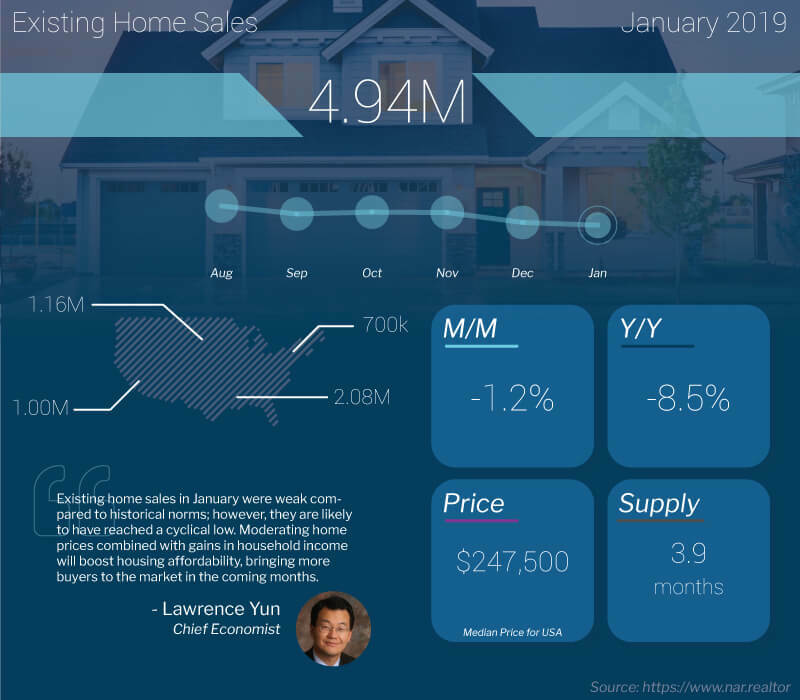 For 2019, Yun is forecasting existing home sales of around 5.28 million, down 1.1% from the 5.34 million sold in 2018. The national median existing-home price this year is expected to increase around 2.2%, down from 2018’s 4.9% increase. Elsewhere, mortgage data from the Mortgage Bankers Association (MBA) showed the number of mortgage applications increased from the prior week. The MBA reported their overall seasonally adjusted Market Composite Index (application volume) increased 5.3% for the week ended February 22, 2019. The seasonally adjusted Purchase Index increased 6% from a week prior while the Refinance Index increased 5%. Overall, the refinance portion of mortgage activity decreased to 40.4% from 41.7% of total applications from the prior week. The adjustable-rate mortgage share of activity fell to 7.3% of total applications from 7.7%. According to the MBA, the average contract interest rate for 30-year fixed-rate mortgages with a conforming loan balance decreased to 4.65% from 4.66% with points remaining at 0.42 for 80 percent loan-to-value ratio (LTV) loans. For the week, the FNMA 4.0% coupon bond lost 32.8 basis points to close at $101.813 while the 10-year Treasury yield increased 10.5 basis points to end at 2.759%. The Dow Jones Industrial Average lost 5.49 points to close at 26,026.32. The NASDAQ Composite Index added 67.81 points to close at 7,595.35. The S&P 500 Index advanced 11.02 points to close at 2,803.69. Year to date (2019) on a total return basis, the Dow Jones Industrial Average has added 11.57%, the NASDAQ Composite Index has gained 14.47%, and the S&P 500 Index has advanced 11.84%. This past week, the national average 30-year mortgage rate rose to 4.57% from 4.45%; the 15-year mortgage rate increased to 4.14% from 4.05%; the 5/1 ARM mortgage rate increased to 4.44% from 4.36% while the FHA 30-year rate increased to 4.22% from 4.13%. Jumbo 30-year rates increased to 4.37% from 4.29%. 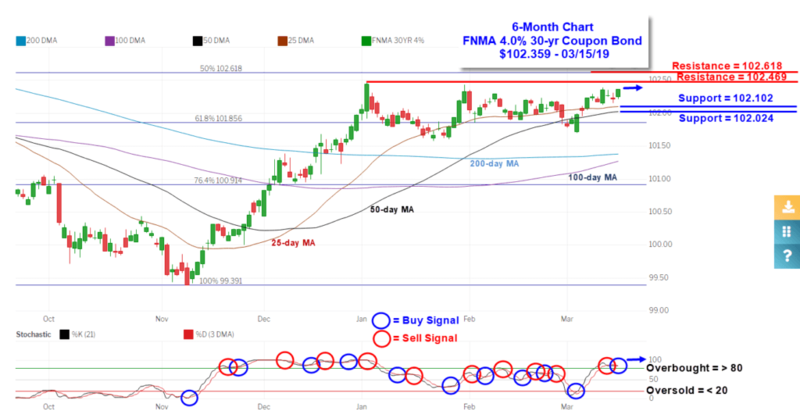 The FNMA 30-year 4.0% coupon bond ($101.813, -32.8) traded within a wider 40.7 basis point range between a weekly intraday high of $102.188 on Tuesday and Wednesday and a weekly intraday low of 101.781 on Friday before closing the week at $101.813 on Friday. Mortgage bond prices trended lower last Wednesday through Friday falling below several support levels defined by the 25-day moving average ($102.048), 50-day moving average ($101.908), and the 61.8% Fibonacci retracement level ($101.856). These levels now revert to becoming technical resistance levels. The bond is not yet “oversold” so we could continue to see lower price movement toward the next levels of support as shown in the chart below. If this coming Friday’s employment report is strong, bond prices will likely test the next support level at $101.578 resulting in slightly higher mortgage rates. By Todd Abelson NMLS #180858 on February 25, 2019 . The major stock market indexes recorded modest gains during this past holiday-shortened trading week (President’s Day) despite some disappointing economic data. Investors were encouraged Wednesday following the release of minutes from the Federal Open Market Committee’s (FOMC) January meeting. The minutes suggested the Fed will continue to be patient and take a “wait and see” approach for future rate hikes. Fed policymakers also indicated they would stop reducing the assets on the central bank’s balance sheet by the end of the year, thus ending the process that has slowly been removing liquidity from the financial system since late 2017. Investors also noticed trade talks between the U.S. and China are progressing to a higher level with a meeting scheduled Friday between President Trump and Chinese Vice-Premier Liu He, China’s top trade negotiator. Also, Bloomberg reported U.S. and Chinese trade officials have begun drafting language on multiple memorandums of understanding containing proposed Chinese reforms that would lead to a final trade deal – a deal China would like to solidify by March 1, when the U.S. is set to raise tariffs to 25% from 10% on $200 billion in Chinese-made goods. 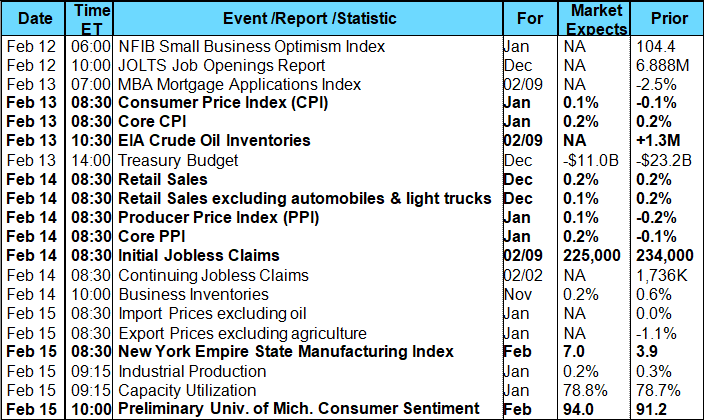 The week’s economic data were mostly disappointing. Durable Goods Orders, excluding transportation, slowed in December, continuing a pattern of decelerating business investment. Also, the Philadelphia Fed Manufacturing Index for February surprised to the downside by falling to -4.1 when a consensus forecast had called for a reading of 12.0. On the positive side, weekly jobless claims at 216,000 were less than an expected 225,000, and IHS Markit’s gauge of service sector activity surprised to the upside. Thursday, the National Association of Realtors (NAR) reported Existing Home Sales declined by 1.2% month-over-month in January to a seasonally-adjusted annual rate of 4.94 million from an upwardly revised 5.00 million in December. The consensus forecast was for 5.05 million. January marked the third consecutive month of declining sales and total sales were 8.5% lower than the same period a year ago. The median existing home price for all housing types increased 2.8% year-over-year to $247,500, the 83rd consecutive month of year-over-year gains. The median existing single-family home price increased 3.1% year-over-year to $249,400. Regionally, Existing Home Sales were +2.9% in the Northeast; -2.5% in the Midwest; -1.0% in the South; and -2.9% in the West. Regional median home prices were +0.4% to $270,000 in the Northeast; +1.4% to $189,700 in the Midwest; +2.5% to $214,800 in the South; and +2.9% to $374,600 in the West. Single-family home sales were down 1.8% month-over-month to a seasonally adjusted annual rate of 4.37 million, and were down 8.4% year-over-year. Inventory of homes for sale is rising. Homes for sale at the end of January increased to 1.59 million from 1.53 million in December, and inventory is up 4.6% from a year ago. At the current sales rate, unsold inventory is at a 3.9-months supply versus 3.7 months in December. Elsewhere, mortgage data from the Mortgage Bankers Association (MBA) showed the number of mortgage applications increased from the prior week. The MBA reported their overall seasonally adjusted Market Composite Index (application volume) increased 3.6% for the week ended February 15, 2019. The seasonally adjusted Purchase Index increased 2% from a week prior while the Refinance Index increased 6%. Overall, the refinance portion of mortgage activity decreased to 41.7% from 41.8% of total applications from the prior week. The adjustable-rate mortgage share of activity was unchanged at 7.7% of total applications. According to the MBA, the average contract interest rate for 30-year fixed-rate mortgages with a conforming loan balance increased to 4.66% from 4.65% with points decreasing to 0.42 from 0.43 for 80 percent loan-to-value ratio (LTV) loans. For the week, the FNMA 4.0% coupon bond gained 12.5 basis points to close at $102.141 while the 10-year Treasury yield decreased 1.0 basis point to end at 2.654%. The Dow Jones Industrial Average gained 148.56 points to close at 26,031.81. The NASDAQ Composite Index added 55.13 points to close at 7,527.54. The S&P 500 Index advanced 17.07 points to close at 2,792.67. Year to date (2019) on a total return basis, the Dow Jones Industrial Average has added 11.59%, the NASDAQ Composite Index has gained 13.45%, and the S&P 500 Index has advanced 11.40%. This past week, the national average 30-year mortgage rate fell to 4.45% from 4.49%; the 15-year mortgage rate decreased to 4.05% from 4.10%; the 5/1 ARM mortgage rate dropped to 4.36% from 4.39% while the FHA 30-year rate decreased to 4.13% from 4.18%. Jumbo 30-year rates decreased to 4.29% from 4.34%. 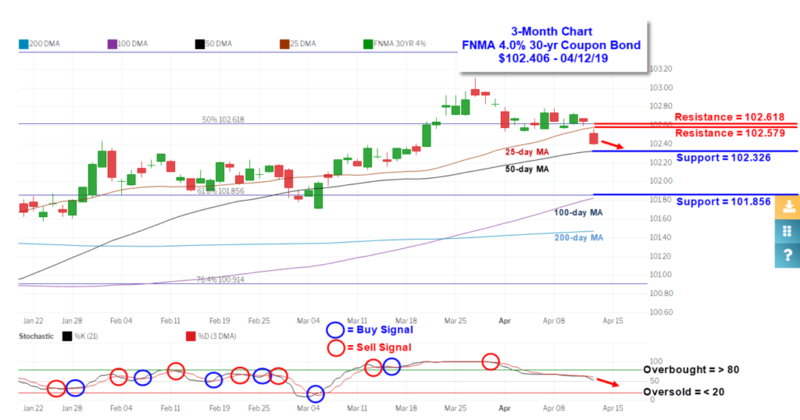 The FNMA 30-year 4.0% coupon bond ($102.141, +12.5) traded within a narrower 26.5 basis point range between a weekly intraday low of $101.969 on Thursday and a weekly intraday high of 102.234 on Friday before closing the week at $102.141 on Friday. Mortgage bond prices trended sideways during the week along the path of the 25-day moving average support line. Price softness in the middle of the week generated a weak sell signal on Friday from a slow stochastic crossover signal. This suggests mortgage bond prices will again test dual support levels as shown in the chart below with a likely outcome of trending sideways resulting in stable mortgage rates showing little change. 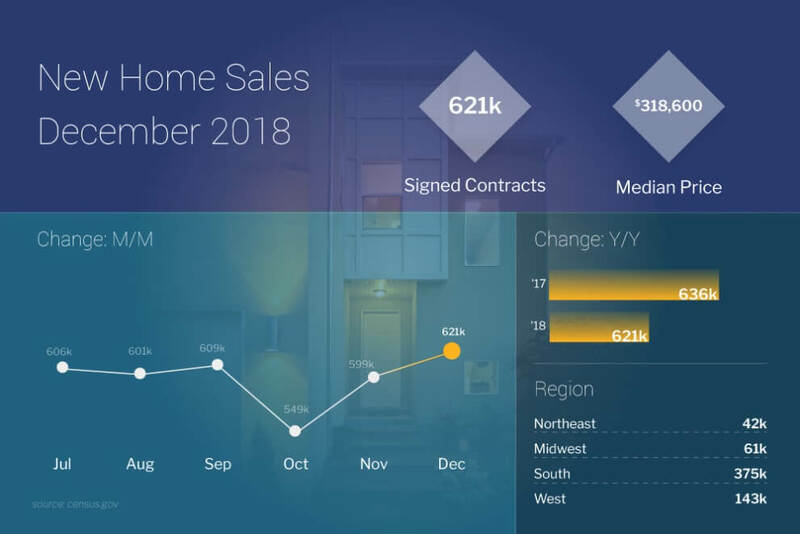 By Todd Abelson NMLS #180858 on February 18, 2019 .